"It's a molecular handle or genetic handle if you wish to now go after other new molecules that people haven't found before," said Wilfred van der Donk, Richard E. Heckert Endowed Chair in Chemistry and Investigator of the Howard Hughes Medical Institute. "So we're pretty excited both about what's in the paper and also what it allows us to do going forward." Natural products, substances produced by living things, have provided us with antibiotics, antifungals, cancer therapies, and other important pharmaceutical and industrial compounds; continued exploration of the diverse chemical world of microbes is one of our best hopes for future drug discovery. A major focus of van der Donk's research is the quest to identify new natural products. Van der Donk shares that goal with a collaborative research team within the Carl R. Woese Institute for Genomic Biology (IGB), of which he is a member. The Mining Microbial Genomes research team aims to accelerate the natural product hunt using the power of next-generation genomic technologies. The tools that bacteria and other microbes use to make natural products are enzymes, specialized proteins encoded by genes. The team's long-term research goal is to learn to read through bacterial genomes and, based on the genes each species possesses, predict what compounds they are able to make. "We were looking for fosfazinomycin as a group for probably a decade, because of the very unusual structure, but we didn't know which genes" provided the enzymes to synthesize it, van der Donk explained. "We decided okay, let's figure out how nature makes this nitrogen-nitrogen bond." 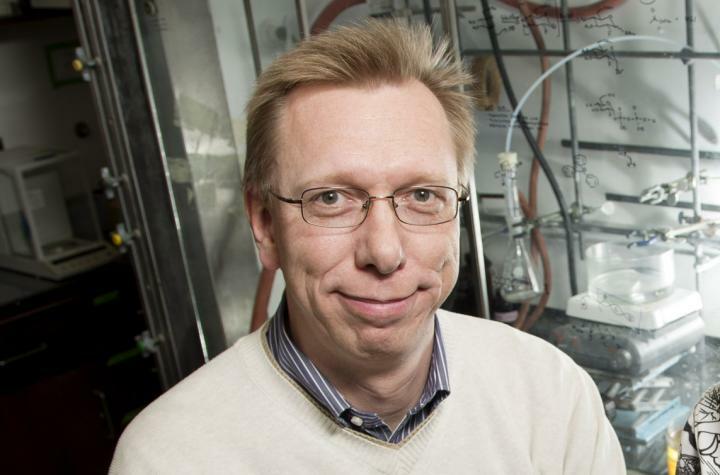 Van der Donk's group discovered with surprise that their molecule's nitrogen-nitrogen bond was not being formed this way. Instead, the bacteria they studied were creating nitrogen-nitrogen bonds as part of a much smaller molecule, like a specialty Lego part, and later installing that part into the larger molecule that would become fosfazinomycin. "We realized as we continued working that in our system, it's done very differently," van der Donk said. "It looked like in our case as if nature was making this nitrogen-nitrogen bond containing molecule as a prepackaged molecular entity that then later on was dumped into an existing biosynthetic pathway." The research project took another serendipitous turn when graduate student and co-first author Kwo-Kwang (Abraham) Wang presented the preliminary results at a conference. He was approached by Harvard chemistry graduate student Tai Ng, who along with his laboratory group led by Professor Emily Balskus was studying a natural product and promising anti-cancer agent called kinamycin. Kinamycin contains a nitrogen-nitrogen bond, and Ng's research suggested that it also shares the prefabrication step suspected for fosfazinomycin. "We had noticed that their molecule [is synthesized using] the same genes, but we didn't really know how that fit in either, because they are making a completely different nitrogen-nitrogen bond containing structure that doesn't look anything like our molecule," van der Donk said. The two groups began to work together, coordinating experiments in which labeled molecules were fed to bacteria able to synthesize each of the two natural products, to see what intermediate molecular structures could be seamlessly introduced into the natural biosynthesis pathway within the cell. "We would make these labeled compounds, give them to the producing organism, isolate the final product, for the Harvard group kinamycin and for us fosfazinomycin, and see whether the nitrogen-nitrogen moiety of the molecules that we were feeding to these organisms was installed into the final product," van der Donk said. "We did that for four different compounds and every time the answer was yes, yes, yes, yes." Finding this improbable commonality in the way two dissimilar molecules are produced increased the researchers' confidence in the functional roles of the genes involved. They now have a new genomic signature to add to their lexicon, something they can scan for in other bacterial genomes as they continue the search for useful natural products. "We need to learn more about how known natural products are made. This is a great example; now that we know, we can use that knowledge. Before that, it was just a whole bunch of genes and we didn't really know what to do with them," van der Donk said. "By going after unknown gene clusters [we hope to be able to] see immediately from the gene cluster, this has to be a new molecule . . . could that molecule be the next antibiotic or the next anti-tumor drug?" The coordinated research efforts that produced this work were supported by the National Institutes of Health, the Howard Hughes Medical Institute, the Research Corporation for Scientific Advancement, and the Camille and Henry Dreyfus Foundation.